Another eatery on my recent trip to Sydney was Gathered Kitchen, a relatively new all vegan cafe in Glebe. My friend had eaten there the day before and brought home some filled bagels for our dinner before dashing to a concert at the Opera House. 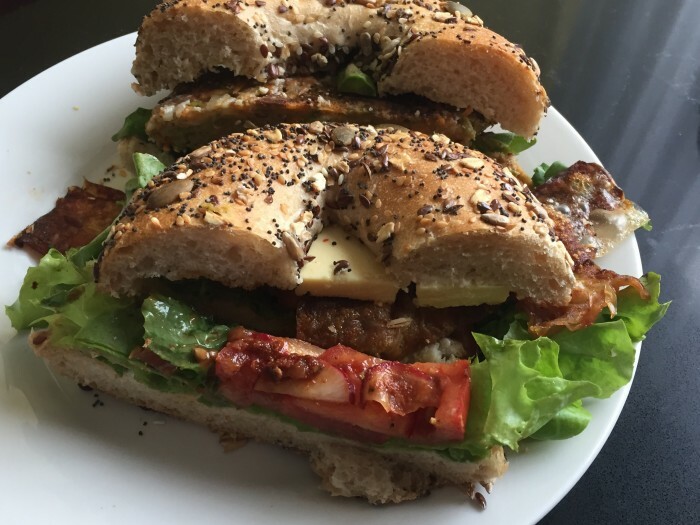 We had two different fillings, one was with some homemade cheese, truffle mayo, BBQ sauce and some really good rice paper bacon, the other with a sweet potato and pea rosti, cashew sour cream asparagus and wasabi mustard, both on great seeded bagels. The bagels were delicious. We headed there a couple of days later for breakfast. On our return I struggled with the wide variety of choices on the menu, but in the end I chose the berry pancakes. 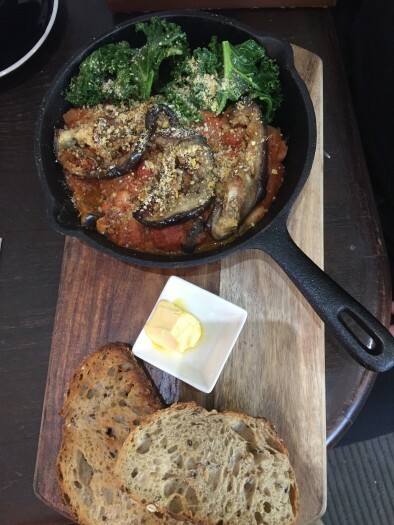 My friend chose an eggplant and white bean shakshuka. The pancakes were both delicious and pretty, with a tart berry compote, some coconut yoghurt and decorated with rose petals. The shakshuka was a disappointment, my nightmare of undercooked eggplant. There was also way too much pepper and oregano in the sauce. It could have been great, but sadly it fell short. In spite of the eggplant dish, I’d happily go back, there are so many other choices including some exceptional looking cakes and pastries.